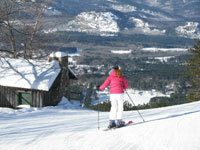 Cranmore is a family friendly ski area located just moments from the heart of North Conway. It is a most historical hillside dating back to 1938, when Hannes Schneider brought the first official ski instruction from Austria to the States. Cranmore is also home to the unique “ski mobile” which debuted that same year 1938. You can still see the bright red cars that carried seated skiers uphill on a cable at Cranmore’s base in front of Zip’s Pub. A new triple chair on the South slopes delivers skiers to the summit, adding 300′ vertical. Cranmore is a cruisers’ mountain, especially popular with young racers for its persistent pitch and 5 minute lift laps on the 1,200’ vertical SkiMobile Quad. Arc speedy GS turns on Competition and North Slope or swerve down Kandahar and SkiMeister. Cramore is lower elevation with a sunny exposure, making it quite pleasant most days. Little kids love Cranmore’s mascot, C-More the Penguin. Parents love Cranmore’s value pricing – very advantageous for learning families when lesson and rentals are included in ticket rates. 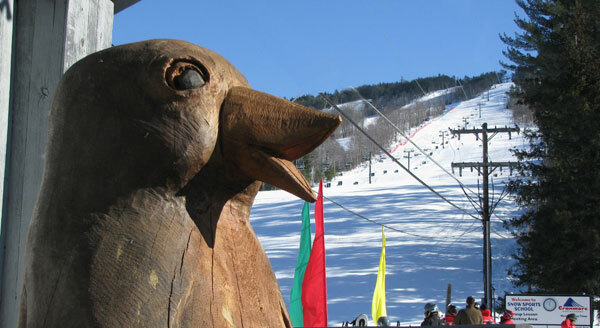 Cranmore is illuminated for night skiing and riding til 6pm on holidays and select Saturdays, plus there is the Soaring Eagle Zip Line, Cranmore’s Mountain Coaster, Giant Swing and snow tubing. Cranmore is a real deal Saturdays during their Cranapalooza party with live après ski entertainment in the Pub for parents, fireworks, face painting, magicians, and use of the Sports Center for kids. 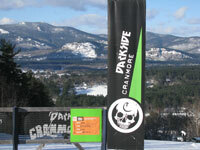 Cranmore offers more than just pleasant skiing and riding for young families; their Terrain Park is edgy and ever popular with the teen set. Night skiing and Arctic Blast Tubing overlook the lights of the Route 16 shoppers’ strip. The Cranmore Sports Center and Fun Zone at the base offers indoor tennis, a swimming pool plus an indoor climbing wall and giant bouncy house. Cranmore lodging for skiers is plentiful with the town of North Conway at the foot of its slopes, from chain hotels to condos to charming inns along Route 16 and 302. Cranmore celebrates its 75th ski season winter 2012-13 and continues to be the annual host of The Meister Cup honoring Hannes Schneider and the 10th Mountain Division.